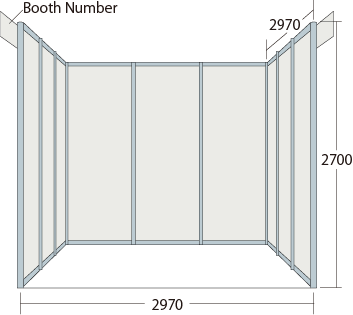 Layout of booths is to be chosen from alternatives shown on the below. Minimun 4 units of booth are required to from "Block type layout." The maximun number of booth allowed to from "Row" type layout is 5. Decorations are permitted to a maximum height of 2.7m for areas within 1m of adjacent booth, rear walls and access aisles, while the maximum height for any areas other than these is 3.6m. Decoration is permitted up to a maximum height of 5.0m. 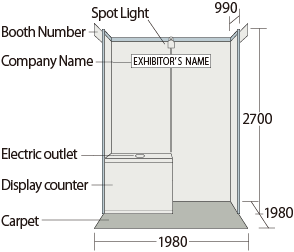 The exhibition fees include: exhibition space―width: 2.0 m × depth 2.0 m―walls (rear and side, 1 m); company nameplate; carpet; exhibition stand--width: 1.0 m × depth 1.0 m × height: 0.8 m―spotlight: 100W × 1; electrical outlets (100V with ground) ―one set of two outlets; installation costs for electrical lines up to 500W; electricity costs. * Additional charges apply for requests of additional equipment. Detailed materials will be distributed at the orientation for exhibitors. * Please be aware that even when the basic display mentioned above is not used, deductions from the exhibition fee cannot be made. The maximum standard height is 2.7 m.
Presentations using equipment such as microphones and speakers cannot be given in the booths. The locations of the booths are not determined by lottery, but rather at the discretion of the host.